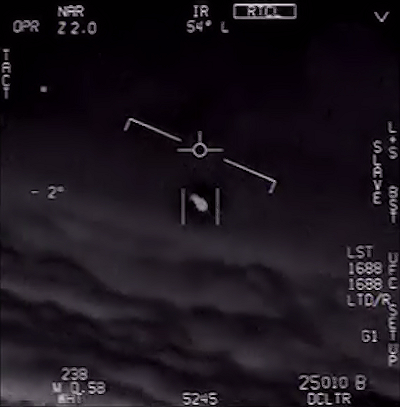 The Gimbal video, which was the first recording presented by To The Stars Academy (TTSA), contains a statement which continues to often be interpreted, likely incorrectly, as suggesting a “fleet” of unidentified aircraft was seen and/or detected by the flight crew. The statement is almost certainly being misunderstood. In all likelihood the individual who made the remark was referring to the common presence of drones, not a high number of UFOs in the vicinity yet not filmed in the video. Let’s explore why. heard shortly past the 1:10 mark in the video posted by TTSA. “There’s a whole fleet of them,” an apparent crew member stated in the clip below. The man was virtually certainly referencing the just mentioned drone. He was in all reasonable likelihood suggesting there are large numbers, or a fleet, of drones in the sky at any given time, not a fleet of UFOs in the vicinity and off camera. He seemed to be figuratively using the term “fleet” to suggest the general commonality of airborne drones. To further clarify the point, an ASA is a flight log. If the TTSA transcription of the statements was correct, and he in fact suggested to look on the ASA, it is extremely unlikely the man would suggest to do that to find a fleet of UFOs in current view. That might particularly be considered unlikely as compared to consulting the ASA for evidence of flights of the immediately just mentioned drones. Apparent AATIP director and TTSA man Luis Elizondo fielded a question Friday, as seen below, about the alleged “fleet” of unidentified aircraft. The issue obviously continues to arise. Elizondo diplomatically declined comment on a “fleet” of UFOs. “There’s a difference between putting out information right, and putting out information right now,” he said. There are many posts around the ‘net about the Gimbal video and other TTSA material. Readers may find some of the analysis of interest. It is not my intention to attempt to definitively identify the craft in the video (I’m not necessarily suggesting it was a drone). Much more information would seem to be required. My aim in this blog post is to help clarify what many have already discussed, yet keeps seeming to get left out of the narrative, about a likely explanation for the often misinterpreted context of the “fleet” statement. It is completely understandable that those intrigued by the UFO topic find the AATIP of deep interest. However, it is important that we weigh the value of information carefully. We should differentiate between authenticated project documents and those (at best) loosely related to the program, as well as apply healthy skepticism to claims lacking sources. Much caution should be taken when we are urged to hold trust in higher priority than a methodical, transparent, and systematic research process. Form your beliefs wisely. The UFO genre has a documented history of careless and questionable individuals who try to form your beliefs for you. It is not unreasonable debunking to expect verification of claims and clarification of discrepancies. Such fact-checking should be considered essential to forming better understandings and developing adequately informed opinions, be it in the UFO community or anywhere else.